If you worship the timeless elegance and over-engineered stolidity of the vehicles that Mercedes-Benz produced in the 1960s, 1970s, and 1980s, then JG Francis's Mercedes Motoring workshop is your heaven. Located on an industrial stretch in Glendale, California, the shop – filled with natural light from the dozen skylights piercing the boat-trussed wooden ceiling – is lined with meticulously reconditioned cars, packed together like avocado green, tobacco brown, and harvest gold sardines. Here, JG and his small team of artisans find, purchase, disassemble, and refurbish these iconic monuments to German monomania. "Everything comes off, " he says, pointing to a newly arrived, ivory-colored 300TD wagon. "Bumpers, lights, carpet, chrome, wood, seats, wiring, grilles. Then we go through, piece by piece, and polish and shine and repair as we put it back together." The cars' mechanical systems – "Anything oily or messy, " as JG says – are rebuilt just down the street at German Motors, an independent Benz repair shop, where JG's cars occupy about two-thirds of the mechanics' business. But since he's creating vehicles to be driven, not simply displayed, JG, and his over 400 customers thus far, like the cars to retain some of their historical character, so he'll leave some signature wabi-sabi element of personal imperfection. As an example, he points out a constellation of tiny scratches in the front window trim of a brown 240D sedan, where a driver used to tap her wedding ring to the beat of the Becker stereo. "And I usually leave the star alone, " he says, pointing to another car's beautifully patinated three-pointed hood ornament, which has just the right amount of wear and pitting. One would think that the best candidates for this reconstructive process would come from winter- and rust-catalyzing-road-salt-free regions like the desert Southwest, but the truth is counterintuitive. "Some of the harshest climates are where you find the best cars, " JG says. "Alaska, Wisconsin, Oregon, Michigan. Because in those places, people took these cars out only in the summer, and then put them away in heated garages for the rest of the year. I get a lot of my cars from the upper Midwest and the Pacific Northwest." While his cars are as close as possible to perfect, his real dream is to build a brand-new, vintage Benz. 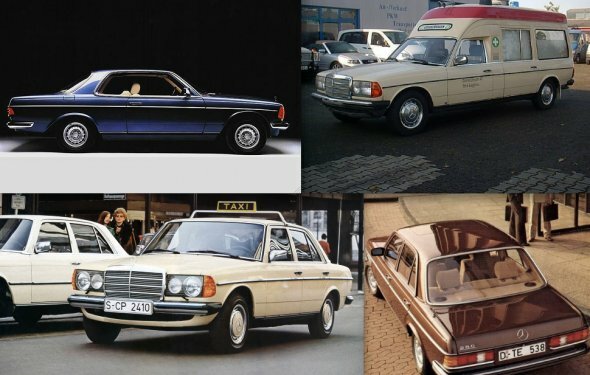 "Every part on these cars is still available new from a Mercedes dealer, " he says, pointing at another of his signature station wagons. "You could buy it all for about $100, 000." He smiles impishly. "A blend of the old and the new. How cool would that be?"